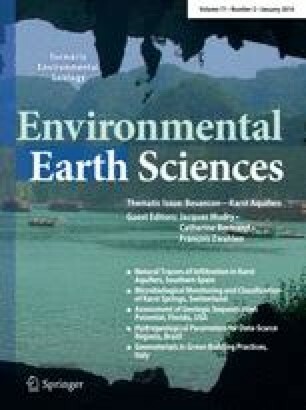 Twenty-eight polychlorinated biphenyls (PCB) congeners were measured in surface sediments from Chaohu Lake to assess their characteristics, potential risk, and the correlation with lake trophic status. PCB levels ranged from 11.074 to 42.712 ng g−1 dry weight (d.w.) in the western lake and 2.017 to 20.189 ng g−1 d.w. in the eastern lake. The highest concentrations were found at the sites near the inlets of western lake tributary rivers where big cities and industrial centers are located. Congeners concentrations showed decreasing order of tetra-CB > tri-CB > deca-CB (PCB-209 detected) > penta-CB > hexa-CB > di-CB > hepta-CB > Octa-CB. It indicated that light and heavy Aroclor mixtures were simultaneously used surrounding the lake basin. PCB levels in the western lake are potentially dangerous to humans and the local fauna. There was a significant positive relationship between tetra-CB (one abundant PCB congener) concentration distribution and sediment grain size in the 16–64 μm fraction, whereas a negative correlation was found in the 4–8 μm fraction. Furthermore, PCB distributions were positively correlated with the total organic carbon of sediments and lake trophic status, especially in the more seriously polluted western lake zone. However, the correlation completely disappeared in eastern lake zone. It suggested that PCB contamination might be attributed to industrial wastewaters and domestic sewages from western lake basin, reaching the lake through rivers, rains and floods. The online version of this article (doi: 10.1007/s12665-013-2487-8) contains supplementary material, which is available to authorized users. This study is supported by the Mega-projects of Science Research for Water Environment Improvement (Program No. 2009ZX07106-001; 2012ZX07101-002), the National Natural Science Foundation of China (No. 40901248) and the China Environmental Public Welfare Program (2010009032).